Auto Collision Repair Market size is estimated to surpass USD 275 billion by 2024; according to a new research report by Global Market Insights, Inc. Growing intercity and intra-city goods transportation is likely to influence commercial vehicle fleets. Rising passenger cars has surged on-road traffic and leading to vehicle accidents and crashes. According to National Collision Database, Canada, in 2016, the number of vehicle accidents rose by 2% as compared to 2015. Increasing number of accidents will positively influence auto collision repair market size over forecast period. Shifting consumer preference towards advanced automobiles with rising disposable income is transforming automotive aftermarket industry. Ongoing developments such as implementation of wireless technologies require innovative machinery and high expertise to address vehicle maintenance. Rapidly changing economy with continuous technological advancements, particularly in the emerging nations will support the auto collision repair market revenue generation. Regular technological innovations by the industry participants will pave an opportunistic way for the product penetration. Increasing adaption of electric and hybrid vehicles owing to surging petrol prices is changing maintenance requirements. However, the advent of new technologies including lane departure warning, night vision with pedestrian control, and automatic emergency braking system will pose a threat to the auto collision repair market players over the study timeframe. The auto collision repair industry involves multiple sales-valuation models. For instance, numerous automotive retailers have introduced “Do-It Yourself (DIY)” packages for the consumers that prefer self-repairing for their own vehicles. The industry service providers are offering consumables including paints & coatings and spare parts to serve larger consumer base. Continuous advancements in the technologies for ancillary products along with additional services such as painting, denting, and body repairs will further augment market growth. 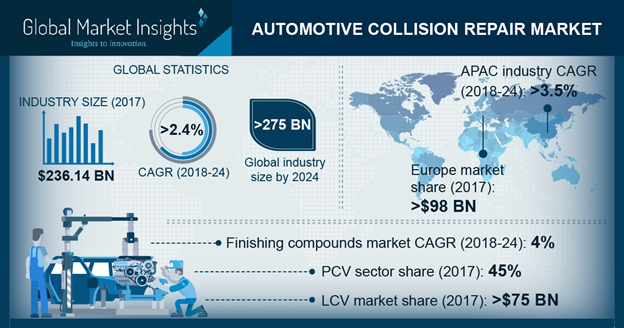 Auto collision repair market from paints & coatings will witness around 2.5% CAGR over forecast period owing to rising traffic leading to rear end crash and dents. Increasing body maintenance to enhance vehicle aesthetics is escalating product demand. Industry participants are developing new technologies for environmentally friendly and durable coatings. For instance, in January 2018, BASF developed high performance coatings to minimize energy requirements and total cost of ownership of automotive paint lines. Adhesives and sealants will witness steady growth over the forecast timeframe with increasing vehicle safety norms and standards along with rising focus on lightweight vehicles. The auto manufacturers are adopting composite materials to keep minimize vehicle weight. Composite materials are unable to be welded or fastened and require structural adhesive. Moreover, adhesives employment for components as small as sensors and as large as vehicle chassis will enhance auto collision repair market revenue growth. PCV will register USD 128 billion by 2024 with increasing passenger car sales over forecast period. According to International Organization of Motor Vehicle Manufacturers (OICA), in 2017, the overall passenger car sales across the globe grew by around 2% as compared to 2016. Moreover, shifting consumer preferences towards shared mobility is influencing vehicle demand. Shared mobility vehicles witness high wear and tear and is likely to favor auto collision repair market growth. New OEMs leads auto collision repair market size with high consumer preference owing to quality, system compatibility and durability to ensure vehicle performance. The original component manufacturers are providing warranty and support to ensure brand loyalty. Further provision of benefits including reliability and better output will further escalate the segment revenue. Independent repair shops will witness steady growth with facilities offering economical repairing services. The large fleet owners prefer independent service shops owing to low servicing cost as compared to dealer owned shops. Moreover, independent shop owners are offering nationwide warranties through the parts suppliers and the associations to enhance auto collision repair market size. Asia Pacific is witness strong growth over the forecast timeframe with extensive production of automotive across the region. High vehicle sales in conjunction with car parc is supporting automotive aftermarket. Industry players are undergoing strategic collaborations to enhance regional presence. For instance, in July 2017, Sompo Holdings, Inc. and PT Indobuana Autoraya collaborated to commence automobile maintenance business. North America auto collision repair market will witness steady growth with increasing heavy and light commercial vehicle fleets. However, improved highway and roadway infrastructure restrict its size till 2024. The major auto collision repair market player includes 3M, Federal-Mogul Holdings Corporation, ZF Friedrichshafen AG, Denso Corporation, Honeywell International Inc., Faurecia, Continental Corporation and Bosch. Industry participants are undergoing strategic collaboration to expand their regional presence. In December 2016, Faurecia announced its third joint-venture with Iranian partners which enable the company to strengthen its presence in Iran.